Busy, busy, busy. Forgive my lack of posts! How do these other bloggers do it? For me, sitting at my computer for any kind of extended period of time while my children are awake is virtually impossible. Forming a coherent thought between the hours of 6:00am and 8:00pm is simply out of the question. Am I doing something wrong??? Once the girlies go to bed, my husband and I can FINALLY catch up and have some quality time before one of us crashes (usually "the one" that has to get up at 5:00am is the first to go!). I am usually not too far behind my hard working husband who leaves at the crack of dawn, but here I am tonight, up way too late, sharing my chicken and rice soup recipe for friends to enjoy!!!! I will regret this in the morning. What are the chances my kids sleep in (i.e., past 5:05am)???? :) Sleeplessness aside, it's so easy and so delicious! Please let me know what you think! Prep Ahead Plan: Toss everything in the slow cooker insert EXCEPT for the brown rice anytime before you want to cook it! I like to do it the night before or up to one day ahead of time! 3 raw, boneless chicken breasts chopped up (You can use raw or cooked or the meat off of a store bought rotisserie chicken! Anything goes!) I used raw in the recipe pictured. 1. Add everything but rice to the slow cooker insert and cook on low for 8 or more hours. 2. Anytime before serving, cook rice according to package directions and add as much of the cooked brown rice as you like to the soup (I add the whole bag). *You can buy regular brown rice and add it to cook into the soup instead of the bag. Sometimes I do this and it soaks up too much of the broth, or my timing is off so I like to cook the rice separate! 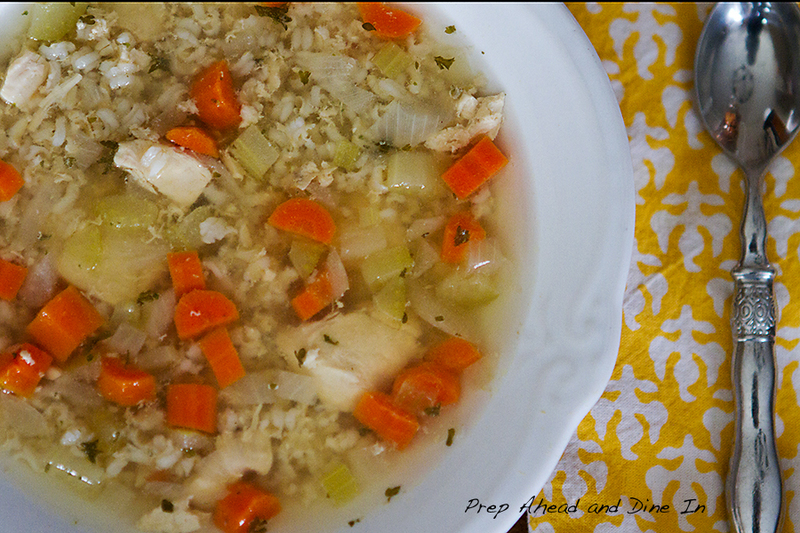 Copyright © PrepAhead and Dine In: chicken and rice soup in the slow cooker. All Rights Reserved.